The concept of Trikaya (3 bodies of a buddha) was developed in the Yogacara. It is also represented as Gankyil, which symbolizes the primordial energy. The Mahayana Trikaya Sutra deals about it in detail. Nowadays, however, there are also different views of the individual kayas in the various linages, and therefore exist veraious explanatory interpretations and additions. The doctrine of the Buddhanature had similar problems. The three spiritual bodies dharmakaya, sambhogakaya and nirmanakaya of a Buddha form in Mahayana and in Vajrayana the trikaya. Approaches of the Trikaya doctrine can already be demonstrated before the origin of the Mahayana. However, the concept was first fully developed in the Yogacara school. Asanga describes the kayas in his Abhisamayalankara. The Lankavatara Sutra calls the Sambhogakaya a Dharmatma (Nisyanda) - Buddha, and it uses the expression Svabavikakaya for the Dharmakaya. Another Sutra of this category is the Trikayasutra( Toh 283, Degé Kangyur, Vol 68 ). These primordial Trikaya - bodies are (unofficial) energetically comparable to the Hindu devas of the Trimurti, and the are thus in the spiritual area of the hinduist Tapaloka. This is howeever only a description of the forces and related bodies, while Hinduism makes gods out of these forces, which as cosmic forces have a specific consciousness and also a secret allegorical meaning. In Hinduism, the aspirant has bodies on every level of consciousness which are related to so-called koshas (shells of the Maya around the Purusha) on the lower planes. In Buddhism stand the Buddhas, Bodhisattvas, Yoginis and Dakinis instead of the hindu gods, each of which is assigned to a kaya. The Trikaya are often interpreted differently in later Buddhism. For example, there is also a nirmanakaya of dharmakaya, possibly verifiable with the hinduist Brahma-Bhairava  etc ..
Sambhogakaya and Nirmanakaya are assigned to the superordinate rupakaya (Wyl. Gzugs sku gnyis; Form-Kaya). However, all worlds below the Trimurti are form worlds, with which still other bodies are connected. In the Mahayoga practice of Narak Dongtruk (Wyl. Na rak skong bshags, 'emptying the lower reaches of its great depths') - Tantra, there are even five kayas (Skt.pañcakāya, Tib. Ku nga, Wyl. Sku lnga): Dharmakaya, sambhogakaya, nirmanakaya, vajrakaya (wyl. Mi 'gyur rdo rje'i sku) of the invariable natural state and abhisambodhikaya (perfect kaya of complete awakening). The Dharmakaya  stands in the Mahayana for the original enlightened all-embracing unity and emptiness of the spirit. It is the ultimate uncreated nature or essence of the enlightened mind(tib. byang-Döbel sems), free from the boundaries of conceptual elaboration, empty of inherent existence (rang-bzhin-gyis stong-pa), naturally radiant, beyond the duality and spacious as the sky, the primordial nature of the phenomena. In the Pali Canon (Digha Nikaya), the Buddha says to Vasettha that the Tathagata is a Dhamma-kaya, the Truth - Body, or the "incarnation of the truth as Dharmabhuta(" Someone has become the truth ") . The Mahayana Buddhist develops a Dharmakaya body (body of the emptiness of the mind) comparable to the Hindu Paramatma-Purusha. Sometimes the Dharmakaya is more associated with the wisdom and the Rupakaya as form-kaya is associated with the compassion. A statement like 'The Dharmakaya of Nirmanakaya is Amitabha' then corresponds to the doctrine that Shiva as a destroyer also has formaspects in the form of lingams (symbolic meaning). There is in this regard also a hindu Bhairava-Brahma. According to Rudolf Steiner, Buddhas who represent the Dharmakaya have since 6-7. century been denominated as Adibuddhas or Dhyani-Buddhas (tib. sku lnga rgyal po). The Saṃbhoga-kāya (Skt. Saṃbhogakāya, Tib. Longku, Wyl. Longs sku) names the perfect body of joy or the spiritual body of happiness (Skt. Ananda) - which is assigned to Vishnu in Hinduism. It is a direct emanation of the Dharmakaya and is also considered as belonging to the Rupakaya. It causes the Ananda-Maya - Kosha in the plain below. Sambhogakaya appears only Bodhisattvas, and it is the basis for the emergence of Nirmanakaya. According to Sogyal Rinpoche  Sambhogakaya is the dimension of complete joy, the field of total abundance, beyond the dualistic boundaries and beyond time and space. Sambhogakaya also includes the five certainties of time (Dus nges pa - due nge pa), the security of the place (Gnas nges pa na - nge pa), the certainty of the body (Sku nges pa - ku nge pa), the certainty of the Dharma (Chos nges pa - choe nge pa) and the certainty of thefollowers (Khor nges pa - khor nge pa). 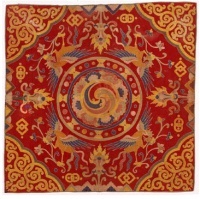 It is depicted as a mandala with the five transcendent Buddhas (Dhyani-Buddhas, Jinas, Tathagatas) Vairocana, Akshobhya, Ratnasambhava, Amitabha and Amoghasiddhi. Dargestellt wird er als Mandala mit den fünf transzendenten Buddhas (Dhyani-Buddhas, Jinas, Tathagatas) Vairocana, Akshobhya, Ratnasambhava, Amitabha und Amoghasiddhi. Nirmāṇa-kāya, the dimension of unceasing manifestation, refers to the manifestation body or emanation body at the level of perception of ordinary beings (thus we are not meant as human beings) in space and time, and thus belongs to Rupakaya. He does not have the five certainties. Nirmāṇa-kāyas like Buddha Shakyamuni manifest themselves for us through all-embracing compassion and appear in the form of enlightened teachers who have vowed to free all sentient beings from the cycle of Samsara. It is e.g. In the Kagyu also regarded as the physical body of the Buddha and would thus be an illusion body. Rudolf Steiner named the fully to Manas converted 'Astralbody', which after death leaves no remains in the Kamaloka, as Nirmanakaya. Even an etheric body, which is completely preserved after death, can regarding to him be named as Nirmanakya . The highest nirmanakaya (Skt. uttamanirmāṇakāya; Wyl. wut mchog gi sprul sku). Its personification is a in the world illuminated Buddha. The Rupakaya or form - body of a Buddha does not refer to the form aggregation of a Buddha but to the actual enlightened Buddha. Nirmanakaya by birth, as in the tenth bhūmi Bodhisattva Śvetaketu in the Tushita sky, who was born as Buddha Śākyamuni, Dampa Tok Karpo. Versatile nirmanakaya (Skt. Janmanirmāṇakāya, Wyl. Skye ba sprul sku), a manifestation to tame different beings from Indra to a young girl. Art - Nirmanakaya (Skt. śilpinnirmāṇakāya; Wyl. bzo bo sprul sku), like the manifestation of the lute players to tame the Gandharva Rabga, and for good food, bridges, pleasure gardens and islands, as well as formes, paintings, woven images and castzed metal statues. In the Nyingma - teachings exists a natural Nirmanakaya (Wyl. Rang bzhin sprul pa'i sku) or nature Nirmanakaya or also 'Reflection Sambhogakaya' (Wyl. Gzugs brnyan longs sku) or 'Half - Nirmanakaya Half - sambhogakaya' (Wyl. Phyed sprul longs sku). A fourth kaya is the svābhāvikakāya(Skt. svābhāvikakāya; Tib. ngowo nyi ku; Wyl. ngo bo nyid sku), which is not another manifestation but the supreme buddha-kaya as the essence of the other kayas  (Buddha nature). It is free from Avidya and the body of true nature. It has natural purity (wyl. Rang bzhin rnam dag gi ngo bo nyid sku) and immaculateness. According to the Uttaratantra II.51 he has five characteristics and five qualities. He is the favorite body of the Kalachakra - tradition. Occasional the kayas are also divided into 5 kayas (Dharmakaya - chos sku / choe ku, Svabhavakaya ngo bo nyid sku / ngo where nyi ku; ; Jnanakaya - ye shes chos sku / ye she choe ku ; Sambhogakaya - longs sku / long ku, Nimanakaya - sprul sku / Truel ku) . Why an adept needs the right to nirvana is just as incomprehensible as he has to renounce his body. One should, therefore, take caution with their views of Buddhism. Thinley Norbu, The Small Golden Key, Shambhala Publications, 1999,ISBN-10: 0877738564; ISBN-13: 978-0877738565 : 15. Saṃbhogakāya. The Tibetan Book of Living and Dying, revised and updated edition , HarperSanFrancisco und London: Rider, 2002, S 347.